2 There was a man there named Zacchaeus. He was the chief tax collector in the region, and he had become very rich. 3 He tried to get a look at Jesus, but he was too short to see over the crowd. The time of day is not specified in the verse above. I have set this scene in the late morning, as in Scene 01. Strong overhead sunlight from the left casts shadows of the figures to the right. A crowd of people. You can see Jesus walking along, between the left hand figures. Zacchaeus is the short man standing on tip toes behind the crowd, desperately trying to see Jesus! 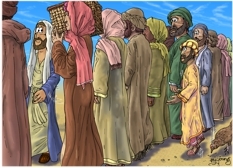 01) (Previous page) Luke 19 – Zacchaeus the tax collector – Scene 02 – Too short (Version 01). I have included a set of red radiating lines around Zacchaeus, which shows his frustration and anxiety. 02) (This page) Luke 19 – Zacchaeus the tax collector – Scene 02 – Too short (Version 02). The only difference between this and the version 01 is that in this scene the radiating lines are absent, otherwise it is identical in content. I had to take a photograph of myself on tip toes to get the figure balance right for Zacchaeus in this scene! I also took lots of photo’s of my back for all the figures looking at Jesus! 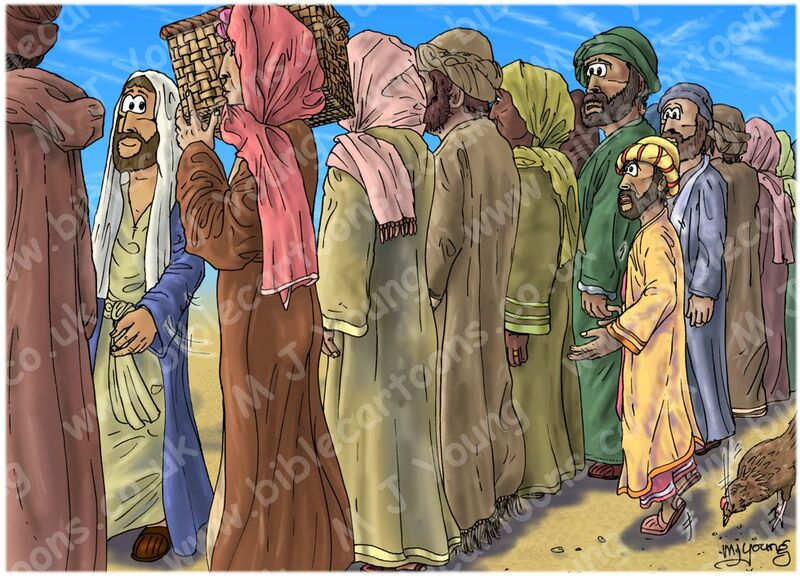 In the first version of this scene I have included some red radiating lines, which is my graphical way of representing the frustration Zacchaeus probably felt, since the Bible text tells us “he was too short to see over the crowd.” In the next scene we’ll see his inventive solution to that problem! Version 02 of this scene (without the radiating lines) is provided for those people who don’t want the scene to look too much like a comic book.